Come to Whiteside Motors when you need a reliable pre-owned vehicle. We have a good selection of cars and trucks with a large portion of our inventory being motorcycles and vans. In fact, we also buy pre-owned vans and motorcycles. There's no need for you to waste time trying to find a loan. Whiteside Motors makes purchasing easier by offering in-house financing. 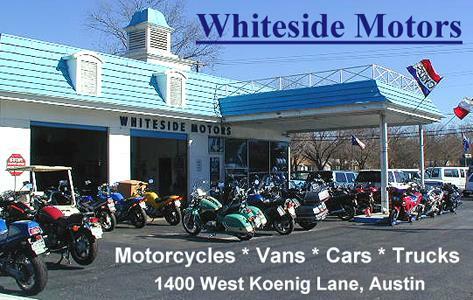 The Whiteside family has been in the automotive industry for over twenty-five years. For fifteen of those years we have had this same dealership on Koenig Lane. In addition, the Whiteside's have been members of the Better Business Bureau since 1982. With that kind of experience and stability, you know you will be able to find a car you can rely on at Whiteside Motors. In a city that is growing as quickly as Austin, it's good to know you can do business with an established automotive dealership.